West Ham have missed Marko Arnautovic. The Austrian was at the centre of the most perplexing transfer saga of the January window, and for all he announced that he would be staying at the club, he has been an elusive figure. Arnautovic did feature for 77 minutes in the 3-0 defeat to Wolves last week, but was forced off with a foot injury and sat out the 1-1 draw with Liverpool on Monday night. According to the Daily Mail, the 29-year-old should be fit to return to Manuel Pellegrini’s squad to face the Eagles, and if he is able, he should be given a starting berth. The whole transfer debacle has been a real mess for the club, and it would seem that it has had a distracting effect on the Hammers – or at least their results would suggest so. Ultimately, this entire episode is hanging over the squad and casting a real shadow over a side that should be rocketing up the table. None of that is going to change until Arnautovic is able to to return to regular first team action, however, and that means having him sitting on the sidelines this weekend would just add to the constant chatter about what happened in January. 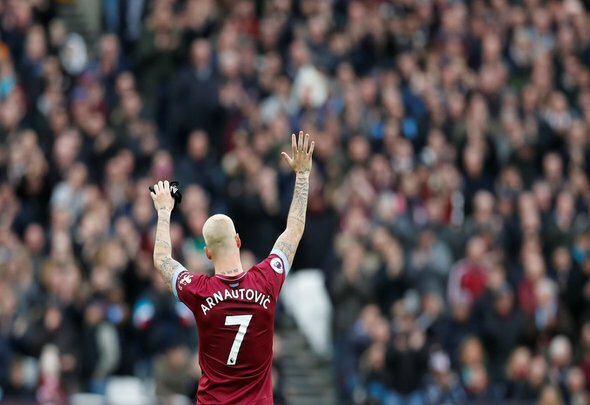 It’s kind of like ripping off a plaster, if the Hammers just throw him in, show that he is back and there to stay, the novelty will soon wear off and Arnautovic can get back to doing what he does best – terrorising defences and showing everybody exactly why he is so vital to the Irons’ cause.